University of Huddersfield history student and library volunteer Haaris Mahmood continues his series of articles for The Secret Library, by looking back over the life of Cedric Clarke: Leeds’ first Councillor of African-Caribbean heritage. This is also the second entry in our occasional People of Leeds series, where we explore the lives and achievements of lesser-known figures from the city’s past. Cedric Clarke – from an electoral leaflet available on request in the Local and Family History department. The city of Leeds, as well as the rest of the country, heavily relies on around the ability of all members of society to engage in politics, regardless of race, religion or ethnicity, in order to ensure the voices of all are being heard. In recent years, the importance of politics, elections and democracy has been called into question by those that refuse to get involved; begging the question “how will my involvement make a difference”? However, there have been countless cases where the actions of one have impacted countless lives in politics. Furthermore, the importance of politics in Leeds is significantly more imperative for minorities living in the city. Being a multi-cultural city with people from all over the world, Leeds is home to many different stories, experiences, preferences and needs that must be heard. There are already well-known figures upholding the needs of minorities around the country, such as Sadiq Khan, the mayor of London, ensuring the voices of south Asian citizens and Muslims in this country are being heard. Specific to Leeds, there have been many developments of minorities getting involved in politics to ensure their voices are being heard on a local and national level. 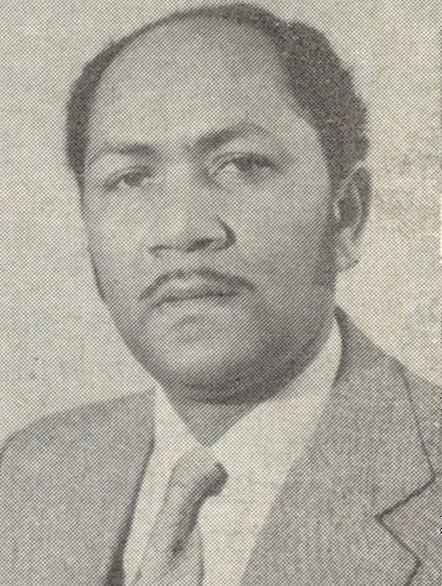 One key local example in history, during the latter half of the 20th Century, who became a central figure for the African-Caribbean community in Leeds, was Cedric Clarke. Clarke was a local resident living in Chapeltown for most of his life with his wife (a district midwife) and eventually his 3 children, and was by trade a local plasterer. However, he was much more, being heavily involved with the community and a member of many organisations before entering politics. Among others, Clarke was a volunteer in the probation services and a senior steward and trainee preacher at Roscoe Methodist church. This involvement with the community heavily increased after May 1980, when Clarke, after working with the Labour Party for some time, became an elected Councillor. He was the city’s first councillor of African-Caribbean heritage, following in the footsteps of other pioneers of the local civic scene. 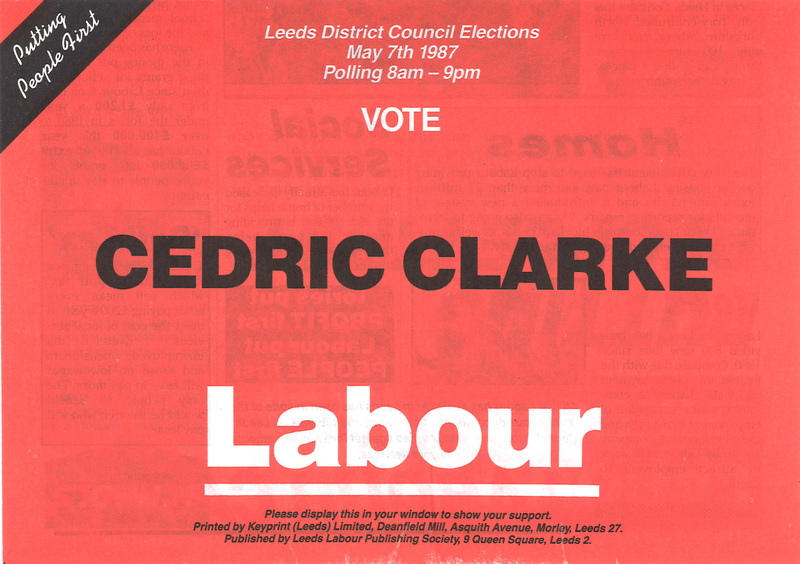 The cover of another electoral leaflet for Clarke – also available on request. Clarke remained a Councillor from 1980-1990. In that time, Clarke became a member of the city’s education Nursery and Industrial and employment committees, vice chairperson of the equal opportunity sub-committee, Chair of the Truancy Panel and was a governor of several local schools, among others. In the first three years as the local Labour councillor, Clarke and others were able to introduce 220 new houses in the area, street cleaning throughout the ward, more home helps for the elderly, several new nursery units and small businesses being established. It is clear to see that the efforts of Clarke’s work had borne fruits for the benefits of the community. Clarke also focused on helping minorities as, by 1987, his main aim was to see school teachers of different racial backgrounds being introduced into schools. It is clear to see that Clarke’s time as a Councillor proved to be significantly beneficial for all. His efforts created results that changed the community for the better and his work was recognised. After representing the Chapeltown ward from 1970 and becoming a councillor from 1980, Clarke was awarded the title of Honorary Alderman in Leeds in 2016. His work is a testimony to the importance of the community getting involved with politics to ensure stability and growth of an area, which Cedric Clarke did by advancing the city of Leeds through the community of Chapeltown. Yorkshire Evening Post. (2016). New Addition to Leeds roll of honour. Retrieved from https://www.yorkshireeveningpost.co.uk/news/politics/new-additions-to-leeds-roll-of-honour-1-7672037. Yorkshire evening Post (1990). Labour Party Stalwart sacked. The Labour Record (1987)- Putting people first- archival source. Yorkshire Evening Post. (2016). New Addition to Leeds roll of honors. Retrieved from https://www.yorkshireeveningpost.co.uk/news/politics/new-additions-to-leeds-roll-of-honour-1-7672037. Lovely article on a great and very kind man. His wife was my midwife too – she was wonderful and knew as soon as she placed her hand on me that my baby was a boy. I’m so glad to see them remembered like this. Thank you for this lovely comment and for sharing your memory of the Clarke family. We’re really pleased to have been able to offer a platform to tell Cedric’s story, and hope that this sparks further interest in his life and achievements.